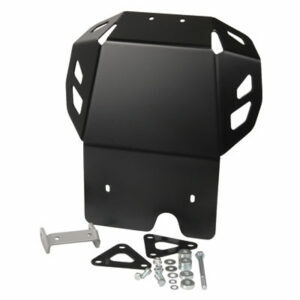 The best KLR 650 skid plate for us here at Usdualsports is a metal SW-Motech skid plate. I have seen and use a plastic skid plate on my KTM 350 and it does great but lets face it the KLR 650 is much heavier and when going over a log a lot harder to get the front end up with the twist of the throttle. Also keep in mind those rocks on the high way that break your cars windshield will also do damage to your bikes engine. The SW-MOTECH skid plate is 4mm think, wraps around the engine, and works with crash bars. If you have a free moment make sure you check out what others have to say and find the best price [HERE].